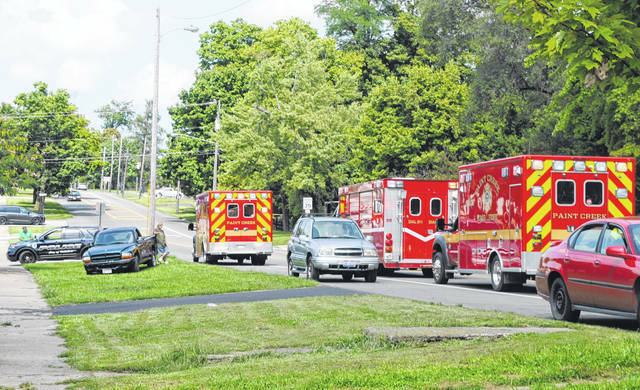 A two-vehicle wreck on North High Street in Hillsboro had traffic down to one lane for some time Friday afternoon, and one person was transported to Highland District Hospital with unknown injuries, according to officials on the scene. Hillsboro police officers told The Times-Gazette that a green truck driven northbound on North High Street by Tim Tolle, 60, Hillsboro, rear-ended a northbound white sedan. An eyewitness said the truck appeared to accelerate after the impact, spinning around through the oncoming lane and driving off the other side of the road, coming to a rest facing south. HPD Officer Brian Butler said Tolle’s passenger was taken to the hospital. Tolle will be cited for failure to maintain assured clear distance ahead, Butler said.